A spicy flavored brine with an intense flavor that soaks into the meat. The brine ensures a meat that is moist, succulent, and loaded with taste. Combine all of the ingredients with 1 1/2 gallons of water in a large nonreactive container and stir to dissolve the sugar and salt. Rinse the turkey under cold running water. Make sure everything is out of the turkey's cavity. Trim off all extra pieces of skin and fat, including the wing tips. Discard. Add the turkey to the brine and make sure the brine covers the turkey. If necessary add more water. Refrigerate for at least 12 hours and up to 24 hours. When ready to roast, remove turkey from the brine and pat dry with paper towels. 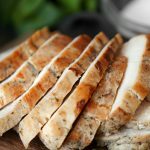 Follow the technique for All Our Way Turkey - Brine it, Bone it, Bake it. Preheat oven to 350 f. Place the boned turkey skin side down in a large pan. Make sure the pieces fit snuggly together - you don't want those juices to evaporate. Generously season the turkey with All Our Way seasoning and rub or your favorite seasoning. Scatter the thinly sliced onions over the top of the meat. Dot the entire turkey pieces with the unsalted butter. After 15 minutes, turn the turkey skin side up in the pan. Sprinkle the white wine over the turkey and salt and pepper this side. Using a turkey baster, baste the turkey with its juices every 15 minutes. Once the thickest pieces reach an internal temperature of 160 F. remove from oven. Loosely tent with aluminum foil and let it rest for 15 minutes. Slice the turkey parts and then put them back into the pan. Baste with the juices of the turkey slices. ENJOY!! This will be one moist and delicious turkey! !